Ruslan Provodnikov of Russia and John Molina Jr. of Covina are fan-friendly fighters in that they’ll take two punches to give one real good one. They are the epitome of ring warriors. Pit one against the other, and a vicious fight can be expected. That should be the case when they tangle June 11 in the junior welterweight main event at Turning Stone Resort & Casino in Verona, N.Y. (on Showtime). Provodnikov is expecting nothing less. Provodnikov (25-4, 18 KOs) is a former world champion. But Molina lost his only world-title fight. And at 33, Molina (28-6, 23 KOs) may not get may more chances, which means this is a really big fight for him. A victory could help him get another shot at the promised land. “We definitely want to catapult off of a big, marquee name,” Molina said. “We want to be on the winning side. That is the goal 110 percent. We won’t be satisfied with anything less than a victory. I’m not content with getting in these fights because people love to watch me fight. 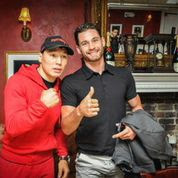 Junior welterweight champion Ruslan Provodnikov of Russia and Chris Algieri of Huntington, N. Y. both made weight Friday for their fight Saturday at Barclays Center in Brooklyn (on HBO). 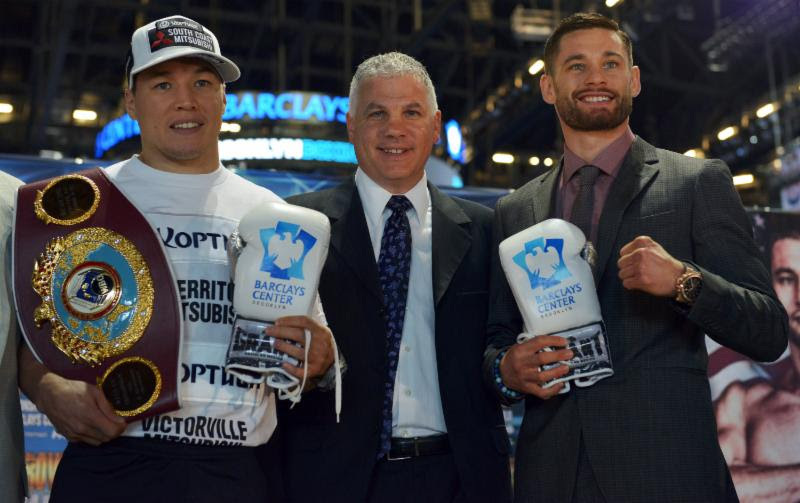 Provodnikov (23-2, 16 KOs) weighed in at 139.8 pounds and Algieri (19-0, 8 KOs) came in at the 140-pound limit. HBO will also televise the replay of this past Saturday’s middleweight title fight between Sergio Martinez and Miguel Cotto, won by Cotto via 10th-round TKO. Ruslan Provodnikov, who will defend his junior welterweight belt Saturday against Chris Algieri at Barclays Center in Brooklyn (on HBO), was very candid recently when talking about his younger days in Russia. Provodnikov, 30, is a real brute in the ring. He is 23-2 with 16 knockouts and has become one of the more vicious fighters out there. Algieri, of Huntington, N.Y., is 19-0 with eight knockouts. Junior welterweight champion Ruslan Provodnikov of Russia will be ringside at the Venetian Resort in Macau, China on Saturday when Manny Pacquiao and Brandon Rios square off there in the welterweight main event (on HBO pay-per-view). Provodnikov and Pacquiao are friends and former sparring partners. Both are trained by Freddie Roach. “I made sure I was in Macau to support my friend Manny Paquiao in his big return to the ring, and I will be rooting for him in this fight.”, Provodnikov said. Provodnikov, a hard puncher, is coming off a 10th-round TKO of Mike Alvarado in October; Provodnikov took Alvarado’s title in the process. Ruslan Provodnikov entered his fight Saturday with junior welterweight champion Mike Alvarado with the reputation of a vicious fighter. Provodnikov lived up to that by stopping a battered and beaten Alvarado after the 10th round at 1stBank Center in Broomfield, Colo., near Denver. Provodnikov took Alvarado’s championship belt. Both fighters had battered faces. Alvarado was decked twice in the eighth round. After the 10th round, referee Tony Weeks asked Alvarado if he wanted to continue. Weeks was blocking Alvarado, so his response was not seen or heard on the HBO telecast. But Weeks then said, “This fight’s over,” and waved it off as Alvarado sat on his stool. Alvarado, 33, of Denver, is 34-2. Provodnikov, 29, of Russia, is 23-2 with 16 knockouts. Most boxers who become successful in the pro ranks started as very young amateurs. We’re talking 8, 9 years old. At the latest. That’s why it’s always cool to see someone get a late start and become world champion. Such is the case with Denver’s Mike Alvarado, who Oct. 19 will defend his junior welterweight belt against hard-hitting Ruslan Provodnikov of Russia at First Bank Center near Denver (on HBO). Alvarado was kind of in no-man’s land a couple of years out of high school when the boxing bug bit him at the age of 20. “I guess it was just the way I was living,”Alvarado said via telephone this week, when asked what prompted him to take up the sweet science at that late stage. “I mean, after high school I wasn’t really doing anything. You know, work or nothing. So one day I was figuring out what to do with myself and I went to the gym. I was just so determined to do something. I mean, I was multi-talented. I played every sport you can think of. I was a wrestler my whole life. Alvarado, 33, is 34-1 with 23 knockouts. Provodnikov, 29, is 22-2 with 15 knockouts. Mike Alvarado of Denver and Ruslan Provodnikov of Russia will square off in a junior welterweight title fight Oct. 19 at First Bank Center in Denver (on HBO), YahooSports.com and BoxingScene.com reported Thursday. This could be a good one. Alvarado’s past two fights were against Brandon Rios. Rios stopped Alvarado in the seventh round of a slugfest in October at Home Depot Center. Alvarado boxed more in their rematch in March in Las Vegas and came away with a unanimous decision. Provodnikov most recently engaged welterweight champion Timothy Bradley in a barnburner at Home Depot Center in March, Bradley getting a narrow decision. The event is being promoted by Top Rank Inc.
A fight between interim junior welterweight champion Mike “Mile High” Alvarado of Denver and Ruslan Provodnikov of Russia is in the works for Oct. 19 at a site to be determined. It would likely be televised by HBO. According to a story on BoxingScene.com, Provodnikov has already signed his contract. But Alvarado said he was not happy with the money being offered at this moment. We tried to reach out to Alvarado’s promoter, Bob Arum, to no avail. Arum did tell his Top Rank Inc. spokesman, Lee Samuels, he would speak about it more today when he meets with reporters for a luncheon in Hollywood. According to Samuels, the fight is not close to being done. If it comes to fruition, Alvarado (34-1, 23 KOs) would be taking on a fighter who gave welterweight champion Timothy Bradley all he could handle in March at Home Depot Center (now StubHub Center). Bradley won a narrow decision, but he was decked by Provodnikov (22-2, 15 KOs) in the 12th round.